Onepiece 667 Spoilers Quotes:Onepiece 667 Trivia: It was revealed that the World Government considered making Portgas D. Ace a Shichibukai, but he refused and eventually joined Whitebeard’s crew. It is unknown why the position was opened at this time and who was the previous Shichibukai. After seeing Brownbeard’s appearance and hearing what Chopper has to say, Luffy heads out to retrieve [Nami]. Franky is going with him, and demands some Rumble Balls from Chopper. Chopper says he won’t be able to control the effects, but hands some over anyway. Chopper starts to explain how to use them but Franky uses some immediately and begins rampaging. Luffy doesn’t realize, tells Franky “Let’s go,” and Franky starts to attack Luffy. Caesar says that all he wants is Franky’s beam- he doesn’t need anything else. Because of the Marines’ attack, it seems like he’s once again setting up for a gas explosion attack. 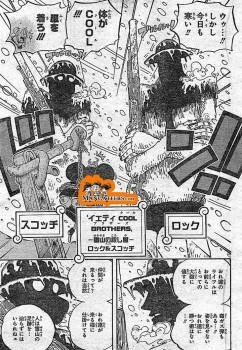 Nami argues with the Cool Brothers. She says they’ll be sorry when Luffy shows up [this is cut off, but easy enough to guess]. We get the Cool Brothers’ introduction, but we can’t see their faces, and they’re complaining about the cold (because they’re naked…). Luffy and Franky follow the footprints off the edge of a cliff. Taking advantage of the group’s split-up, the Cool Brothers drop an iceberg on the duo, but Franky throws it back. Scotch repels it. Luffy is annoyed by the persistence of Franky’s rampage and hits him with an Elephant Gun. During this time, Nami is carried off again by Lock, and Law appears. Scotch is cleaved in two (!?) by an attack called Counter Shock. His glasses are broken, and he falls. 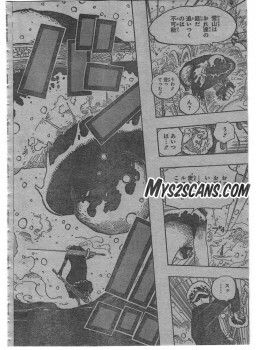 Onepiece 667 Spoilers at mangabox.wordpress.com will out on Tue or Wed. 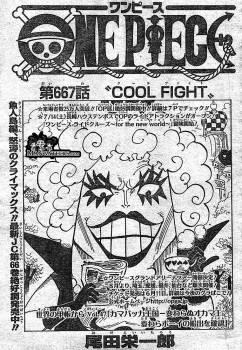 If you like discuss the onepiece ワンピース ネタバレ 667 please leave a comment bellow. Please be patient.